Tote Bag by ADORABLE ORIGINALS INC. This adorable tote bag with a polka dot handle and a matching bow and rhinestones is perfect for any “dancing diva.” The Adorable Originals collection of fun, fashionable tote bags says “all girl” with creations for jazz, tap and ballet. A matching T-shirt and hair bow are available for a great gift set. Adorable Girl dolls has received an award of excellence and was selected as a "hot" item for children by iParenting Media. I Spy 3-D by BRIARPATCH INC. 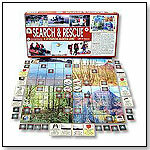 In this game, one to four players put on the included 3-D glasses and enter the magical world of I Spy. They read the rhymes and explore the 3-D tiles to find the floating objects and solve the riddle. Players can create game boards by laying down the tiles in different patterns. Briarpatch VP of Sales Alex Fazio told TDmonthly that “the optical 3-D illusion aspect of the game play that directly ties into the themes of the Scholastic I Spy books,” sets the game apart and makes it ideal for specialty stores. This product received a 2007 iParenting Media Award for Outstanding Products and an Oppenheim Toy Portfolio Platinum Award. Launch date: March 1, 2007. In this adventure game for two to 12 players, four areas in the park are reserved for exploration — a lake with an island, desert conditions, mountainous trails and forest paths. Stormy weather comes along and a child, a young woman, an older man and a family of five are missing. The Search & Rescue team must share equipment, develop strategies and contend with mounting storm centers in order to save them. The company requires a $100 wholesale minimum, and the game can be mixed with other titles. This game made Dr. Toy's Spring 2007 Best Products List. Launch date: March 2007. Silly Stix™ by FAMILY GAMES INC. In this clever little memory game, children drop brightly colored rods of varying lengths down hollow blocks of varying depths. The first player to line up three level heads in a row wins the game. When the rods are dropped, will they fall to the bottom of the block or stop somewhere in between? Kids can switch the blocks and heads around each time they play to encourage memory development and essential silly skills. The game includes nine wooden blocks, two rod holders, two sets of rods (each set composed of nine different colors) and instructions. This product is a 2007 iParenting Media Award winner. Launch date: June 2007. This popular new laser game now has a 6"- by 6"-square add-on that creates a second level of play atop the original 10"- by 8"-square board. Players alternate turns moving mirrored pieces around the playing field and firing laser diodes to illuminate, and eliminate, their opponent’s pieces. Moves can now include a directional move or rotation of the expansion tower, or movement from the upper to lower level and vice versa. — Khet 3D: Tower of Kadesh adds more excitement to the popular laser-beam game, employing additional board space so that lasers can not only bounce off mirrored pieces on the main playing field, but also enter a whole new dimension by finding their way up a tower to the second level. The strategy, creativity and materials involved in this game earned it a TDmonthly Innovations 2007 award. Frightened Grasshopper Mini Solar Robot Kit by OWI INC. Eyes jiggle, legs wiggle and antennae sway to-and-fro in the combo tango-jitterbug-Frightened Grasshopper dance. This little kit is an attention-grabber. 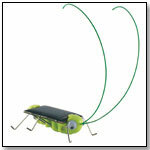 Pint-sized and powered to pack a punch, this enticing amusing solar bug will capture kids’ hearts while demonstrating an alternative energy principle. No batteries or tools are required, and there are fewer than 10 parts to assemble. This product received a 2007 Seal of Excellence from Creative Child Magazine. Launch date: February 2007. — For promoting the use of solar energy in a hoppin’ way, this cute, little grasshopper received a TDmonthly Innovations 2007 award. It is simple to assemble and reacts immediately when placed under sunlight, clicking its legs across the ground as it rattles around, shivering with fear. Elite Fleet R/C Hyperflyer Stunt Plane by KID GALAXY INC. The sleek silver and green, dual-winged Hyper Flyer is a radio-controlled stunt plane that can perform amazing aerial stunts including loops and barrel rolls. The plane can dive, roll and spin, and take off from the ground. It can perform touch-and-go stunts for fast land-to-air take off. With its state-of-the-art charger, the Hyper Flyer is ready for aerial action in just five minutes. It is constructed from virtually indestructible EPP foam. This product is a 2007 Creative Child Toy of the Year Award winner. — “All of the new items from Kid Galaxy were great,” Idanna Smith, owner of Juggles in Wakefield, R.I., told TDmonthly about Toy Fair 2007. With this bilingual experiment kit, children can learn science fundamentals through 25 experiments that cover five key areas: biology, physics, chemistry, air and water. It includes a 48-page color guidebook with simple pictorial instructions and text in English and Spanish. “Because the steps are clear and easy to follow, a child as young as 5 can successfully complete the experiments,” Christa Raimondo of Thames & Kosmos told TDmonthly. The Little Labs series also includes single-topic kits on plants, physics, light and colors, animals, weather, and cars and motors. This product is a Fall 2007 Parent's Choice Award winner. Launch date: June 2007. This dynamic, new line of 44-key baby grand and upright pianos, launched to coincide with Schoenhut’s 135th anniversary, features true piano sound … without the use of electronics. The mid-sized piano is less intimidating for small children who want to learn to play the piano. This line is not intended to replace Schoenhut’s vintage models that feature chime-like tones, such as those originally developed by Albert Schoenhut in 1872. Rather, the introduction is in response to requests from customers for a “new” sound. It’s available in black, white or red. Launch date: January 2007. — If parents wish to start their kids on the piano before they’re ready for the real baby grand, this stunningly beautiful instrument with authentic piano sound is the way to go. It received a TDmonthly Top Toy 2007 award for innovation in mechanics and design within the category of musical instruments for children, as well as its ability to grace any space while furthering a young child’s music education. Used for years in dental offices, Magi is a plush dragon designed to assist parents and children with the demonstration and practice of proper brushing and flossing techniques. The dragon features a mouthful of lifelike teeth and comes with a three-minute sand timer and four children’s toothbrushes that can be held by his bendable arms. “There is not another product on the market that addresses the childhood challenge of tooth brushing and proper care for a child’s teeth in a fun way! The Surgeon General reports that the number one chronic childhood disease is tooth decay,” Kathi James of Paragon International told TDmonthly. The product has won various awards: a 2007 iParenting Media Award, a 2007 iParenting Media "Hot" Award, a 2007 Teachers' Choice Award, and The National Parent Center Award in fall 2006. Launch date: December 2006. Viewing products 1081—1090 out of 1181 products.